This segment of The Law and You features personal injury trial lawyer Don Corson discussing what you should do if you are in car, truck or motorcycle accidents. For over 30 years, Don has handled cases that involved getting insurance to pay what is owed in serious accidents that result in catastrophic injuries or even death. JOEL: This is Joel Block for The Law and You with Eugene attorney Don Corson. 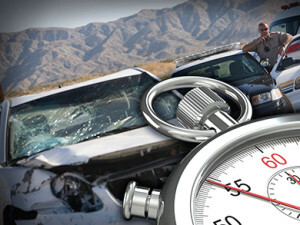 Don, what should you do after an auto accident? DON: Joel, with a truck or auto collision remember, what you say may be used against you–even if you are not to blame. Stay at the scene, call for emergency help and report the collision to your own insurance company. If there was injury or death or the vehicle was towed away or there was $1500 or more in property damage, you must submit a report to the DMV within 72 hours. You are not required to make any statements or provide authorizations to the other party’s insurance company. Remember the other side’s insurance company is not looking out for your interests; only theirs. With serious injuries, evidence MUST be preserved. Too often vehicles are towed away and even destroyed. Important evidence can be lost. Have an experienced personal injury attorney on your side to make sure all evidence is kept. JOEL: Thanks, Don. If you have a legal question or for a copy of How the Law Works, visit CorsonJohnsonLaw.com. The Law and You is a community service and does not replace the advice of an attorney. The Corson & Johnson Law Firm, a Eugene, Oregon personal injury trial law firm, produces and distributes The Law and You as a continuing public service to help families and consumers answer questions about our legal system and how it works for them. If you have suggestions of legal questions or topics you would like addressed by The Law and You, please contact us.